White distilled vinegar is another green way of tackling light mould problems in your home, similar to using baking soda. 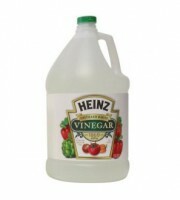 Using vinegar is extremely safe and environmentally friendly, so it’s ideal if you have concerns over children and pets. For serious mould infestations, a more heavy duty solution like bleach maybe better served, but for small, every day mould issues, vinegar is a perfect solution. It is a mild acid which can kill 82% of mould species. Vinegar does have an unpleasant odour, which can linger, but it will dissipate after a few hours. Slice lemon into 4 pieces using knife and chopping board. Squeeze lemons onto a pot and remove any seeds. Pour 1 cup of vinegar and lemon juice into the spray bottle and shake well. If required, repeat process until mould is completely removed.